Whenever a student wanting to work in the design industry asks me for advice, the first thing that comes to my mind is the importance of maintaining a current and up-to-date skill set. Often, we spend so much time focusing on the actual jobs at hand that we neglect to nourish and refresh our knowledge. This article aims to highlight the importance of setting aside time for self-improvement, with recommendations on how you can keep learning to stay ahead of the curve. While many people may feel that they can’t afford (or have the time) to put aside some time in order to learn and keep up with industry developments, I would argue that they also can’t afford the losses in competitiveness due to having outdated knowledge. Often, the individuals who stick with what they know are the ones finding themselves out of jobs because the nature of the profession, the technologies, and the medium is such that it evolves quickly. Conventions change, web languages are updated or become obsolete, deployment methods shift from technology to technology. It’s survival of the fittest, with “fit” being defined as someone who keeps up with current demands. Imagine if Yahoo! had rested on its laurels. Learning new skills doesn’t have to be complicated, and it doesn’t even have to be expensive. And in an industry that is always changing — and where becoming stale means being unable to perform — the need for continual self-education and self-training is very important. With all of that in mind, I’d like to suggest a few ways we as web designers can keep ourselves current. The first thing I’ll mention is probably the most expensive in terms of money and time. However, it’s worth discussing because it is the traditional way of learning a particular profession. Education is probably the most obvious route to self-improvement. You can find courses on pretty much anything — from graphic design to ancient Mediterranean studies — these days; courses tailored to your exact interests and needs. 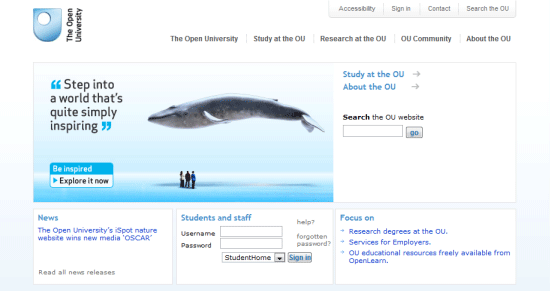 The Open University is based in the UK and offers plenty of structured courses. The benefits of sitting in a classroom are quite apparent if you thrive on structured learning plans. The experience of being in a classroom also means you’ll get to hang out with peers who’ll be in the same position. The problems with education, especially in very traditional colleges, is that courses might be outdated and can cost quite a lot. In terms of getting an internship at a design agency, the learning you get is often practical. You can get to see how professionals handle their job tasks, and learn through hands on experience. Even well known agencies might have an intern position available to you. Often, we learn a lot through observation. If you’re a beginning freelancer or a student just finding his way through the world, getting into a proper business as an intern will give you not only the guiding hands and experience of professionals, but also potential job offers if you prove yourself to be a good fit for the company. Potential downsides are that internships may be unpaid (voluntary). An internship is also a real commitment in both time and effort. However, the experience may be truly rewarding if you are a committed individual. Also, with an internship, the value you get depends on who you’ll be working for and what they’ll task you with. If you get stuck in an internship that only deals with activities such as running to Starbucks to get the design team their coffee or sorting out mail, then you would get less value, learning-wise, than in an internship that gets you right in the mix of things and interacting with professional designers. That’s one thing to keep in mind when searching for an internship. All over the world, you’ll find a range of conferences at different budgets and topics (such as The Future of Web Design). A conference is a time-honored tradition for many designers and developers in which a bunch of caffeine-intoxicated geeks gets together to learn from industry experts and each other. While these events can be particularly expensive, they usually cover a wide range of subjects and can allow you the time to speak to people you respect, make a few friends and, in some cases, get some extra business. If you’re socially inclined, it can turn into a great few days of learning, sharing and socializing. Over recent years, workshops have really evolved into something quite special. While many exist in which you visit a particular venue and learn about a subject from an industry guru, plenty of websites now also offer web-based workshops that allow you to learn from the comforts of your own workspace. While you won’t get a certificate or qualification (as you would through a college), the benefits from these workshop sessions are that you’ll get a ton of knowledge on a specialist subject in a short period of time and in a structured manner. Getting to know your fellow designers and developers is a big part of being involved in the industry. It’s surprising to see how many people isolate themselves from the design and development community and thereby fail to get the benefits of networking (and mentoring). Getting your name out there socially will give you a range of benefits, not just to your social life, but also in terms of boosting your own knowledge and being able to assist others in improving their own work. Social networking is quite a simple idea. You join a community — whether it’s offline such as a chamber of commerce group or online like a forum or social networking service like Twitter — and then you interact with other people! Not only will you make friends and gain useful industry contacts, but also, you can learn plenty from other people’s experiences. Even better is that you aren’t forced to dedicate a set amount of time to networking; you can participate in networking on your own time. Mentoring is much like networking in terms of the social interaction with other people, but it does give you a slightly different route to learning. Some charge for consultancy services and other people mentor for free… both work! Finding someone to mentor may seem beneficial just to the individual being mentored, but when you think about it, the student is going to be testing your knowledge and sharing their thoughts with you. This gives you motivation to keep your knowledge up to date, as well as discover things you might not have thought about. As they say, the best way to learn is to teach. If you’re a bit shy and don’t really like the idea of going back to school or being in a room with other people, consuming books, articles, eBooks, videos and slideshows may be a perfect method for self-betterment. This method of gaining new knowledge is by far the most prevalent. There are literally thousands of cool titles and resources sitting out there waiting to be purchased, read and watched, as well as a lot of free content too! You are here… and while Six Revisions is not a book, it’ll still teach you oodles of useful information. Books are probably the most widely recognized resource when it comes to learning about a specific technology, and there are plenty of articles and resources online. With millions of titles to choose from on just about every subject you can imagine, they can be a reasonably priced, go-at-your-own-pace alternative of learning. How Do You Design (Beta)? If you’re not one for going through pages of text in order to learn, and you prefer something that engages many of your senses, perhaps you might consider the range of audio and video podcasts that exist for designers and developers. Podcasts like those provided by the 5×5 network offer design and development fun! While not on many people’s radars, these shows give you industry news and great advice for free! In addition, there’s plenty of paid and free slideshows and videos which can train you in a particular craft while visually orientated and worthy of consideration. What’s convenient about podcasts, especially audio podcasts, is that you can listen to them while commuting to work. A final route worthy of consideration is learning through side projects. Taking on a side project allows you to learn and sharpen your skills by doing something fun. It’s not a secret that personal projects are good for you. Consider having a side project to help you learn at your own pace. Your side project can be pro bono design work for an organization you’re passionate about or building a web app that solves a problem (and if it’s good, who knows, it might become profitable). You could start a blog, create a podcast, self-publish your own books or eBooks, provide tutorials — all of which can reinforce the things you learn day-by-day. The ability to publish your own book through services such as Lulu has become quite popular! While side projects may arguably be among the more ambiguous, indirect ways to learn, it’s also true that theory you learn from books and classrooms will only take you so far and that practical experience has its own benefits. Surviving and succeeding in this industry requires constant upkeep of the things you already know. If there’s one thing that I admire above everything else, it’s the enthusiasm and craving for knowledge that many of us still manage to maintain after working in this fast-paced environment for years. If you only dedicate a couple of hours a week to self-improvement, that’s still better than nothing. In any business, you don’t want to become the weak link in the chain, and setting yourself up with some long-term goals will help you avoid becoming the individual whose work has the reputation of being outmoded. There is always something new to learn, and those awesome new skills can bring more value to you and the people you work with/for. So go out and buy that book you saw on Amazon.com, learn that new web language you’ve been putting off for too long, read that new blog everyone keeps talking about, sign up for that workshop, or watch that video — whatever you do, just never stop learning!